Think you've tasted refried beans? You haven't tasted anything until you've taken a bite of our melty-cheese-and-tomato version. Better than just good. Supreme. Mix beans and 1/2 cup of the cheese in 1-quart microwavable dish; cover. Microwave on HIGH 3 to 4 minutes or until heated through; stir. Sprinkle with remaining 1/2 cup cheese. Microwave, uncovered, 1 to 2 minutes or until cheese is melted. Sprinkle with tomato and onions. The cheese, tomato and onions liven up canned refried beans to make a flavorful side dish perfect for a special occasion. 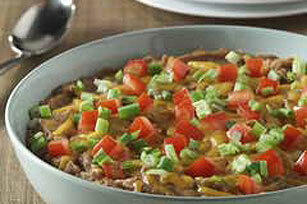 Prepare as directed, using TACO BELL® Refried Beans with Mild Green Chiles. Mix beans and 1/2 cup of the cheese in 1-quart baking dish; cover. Bake at 350°F for 20 minutes; sprinkle with remaining 1/2 cup cheese. Bake an additional 5 minutes or until cheese is melted. Sprinkle with tomato and onions.